Shirts With Random Triangles: Shocker: Urban Meyer isn't satisfied with Ohio State's Week One performance. Shocker: Urban Meyer isn't satisfied with Ohio State's Week One performance. Urban Meyer during Aug. 30 Ohio St. game vs. Navy. Photo via cleveland.com. Think Ohio State head coach is satisfied with the Buckeyes' Week One performance in the team's 34-17 neutral site win over Navy? Child, please. This is Urban Meyer we're talking about. 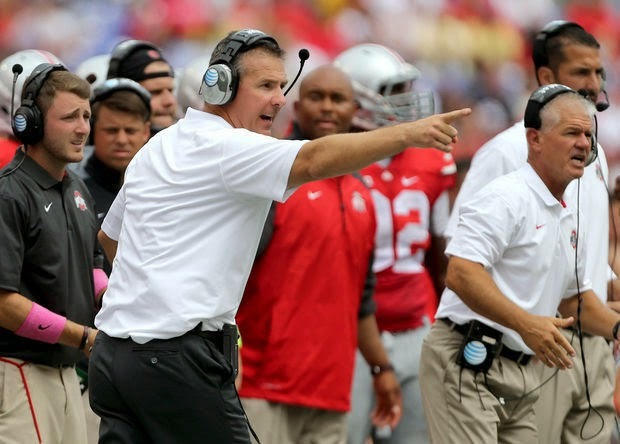 Meyer expressed concerns over his team's performance in a press conference on Monday. "Concern number one is offensive line. We're facing (what) will be one of the top one or two defensive lines we'll face all year," Meyer said Monday. "Our offensive line did not play like an Ohio State offensive line. The second half we played pretty good. But pretty good is not what we expect. You play pretty good this week you won't win that game. So we have to get much better fast in the offensive line. " Meyer's concerns are natural, as the Buckeyes' are scheduled to host Virginia Tech this coming Saturday. Hokies' head coach Frank Beamer's praise for the Buckeyes and for the performance of redshirt freshman quarterback J.T. Barrett probably won't be enough to satisfy Meyer, either. On Michigan, Brady Hoke, and Dave Brandon. Charlie Weis is an ex-Kansas head coach. FSU suspends Jameis Winston for obscene outburst. The Fallout: Brent Hundley and more. NCAA ends sanctions on Penn State. Is Michigan State the Stanford of the Big Ten?